TLDR (Too Long Didn’t Read) is an extension developed by Stremor for Google Chrome which can summarize web articles according to users need without leaving the source page. Powered by Liquid Helium, TLDR extension analyzes the content and creates summarized versions in four formats (Summary, Short, Medium and Long) on any web page, including some of the popular web applications like web mail, ZenDesk, SalesForce, SugarCRM, and others. TLDR also has iOS, Android and Windows Phone app. Language support: English, Spanish, German, and French. 1. 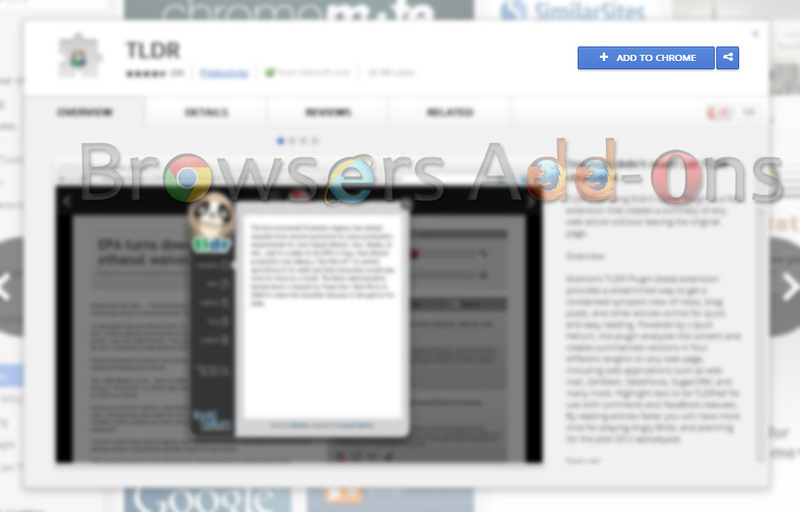 Go to Chrome web store an search for TLDR, or simple click on the above download link and click on “ADD TO CHROME“. 3. Now, a TLDR icon with message pop up appears at upper right corner of browser, indicating that the extension has successfully integrated with the Chrome. 1. Click on the TLDR icon when you need to summarize the web article of current web page. 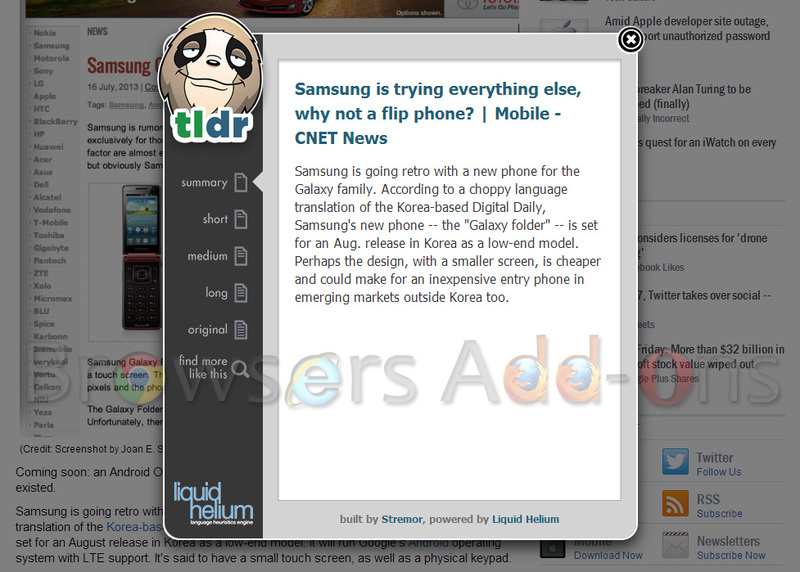 After analyzing the content, TLDR extension summarize the article and displays on pop-up. You can change the length of the article by choosing the desired options on the left. 2. 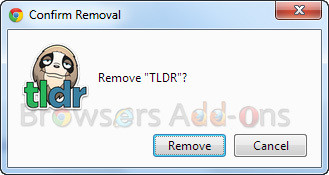 To change preference (options), left click (LMD) on the TLDR icon and click on “Options“. After changing preferences, click “Save“. 2. Now, un-tick the TLDR to temporarily disable the extension. Click on the dustbin icon and you will be greeted with pop-up, click “Remove” to remove the extension from Google Chrome. 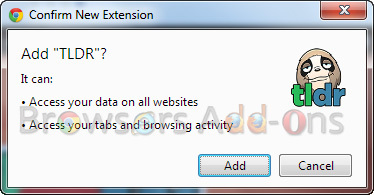 Fixing silly URL typo errors with URL Fixer for Mozilla Firefox. Next story Blocks Ads from your favorite e-mail services like Gmail, Yahoo with Webmail Ad-Blocker addon for Firefox. 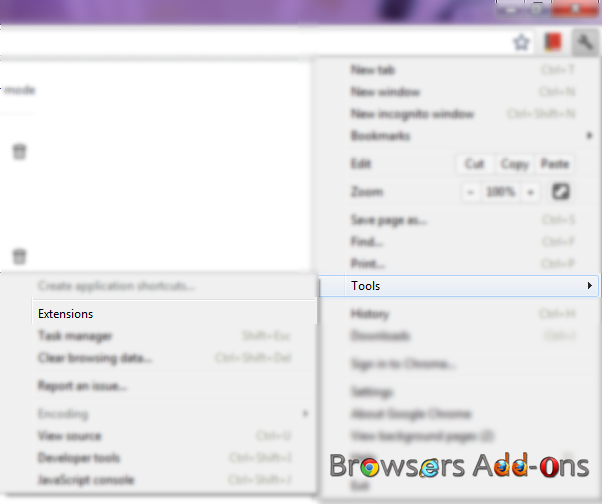 Previous story Take a Break, a must and should Firefox addon for Workaholics.